A clean and well-maintained pool can be a lovely addition to your backyard, and choosing the right pool tile can lend additional luxury and beauty to your swimming pool . If you’re planning swimming pool designs in Birmingham, AL, there are a few things that you will want to know about pool tile. Tile is a versatile feature that can add a depth of character and color to your swimming pool area. Whether you choose to go with the standard tile installation or something more artistic, there are several advantages to consider when thinking about getting tile. Tile is durable and with proper care, it can enhance your pool for its lifetime. Pool tile requires little upkeep, comes in a range of sizes and materials, and its reflective nature can make your pool appear larger than it is. 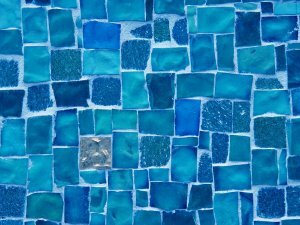 If you already have a pool area designed, glass mosaic tiles can be added to update your pool’s look and are currently trendy for luxury pools. Glazed porcelain tiles are a great option if you are building from scratch and want tile that can extend from inside your pool out onto the deck area. Before selecting your tile, feel its surface texture against your hands and feet so you can be sure that it has an abrasive grain strength that you are comfortable with. Ceramic tile can also be used in and around your pool and comes in a broad variety of colors and styles. Taking proper care of your pool will help maintain your tile. Proper water pH level prevents scale buildup, which creates unattractive brown or white patches. As roots grow, pool walls age, and the ground settles around or under your pool, you may need to deal with damage to your pool tile. To prepare for this, consider buying extra tiles at the time of installation, so you can make any necessary repairs in the future without the hassle of tracking down the right type and color of tile. Choosing the right swimming pool builder for your project is easy if you follow the right steps. When planning for your swimming pool in Birmingham, AL, ask friends, family, and neighbors for referrals and recommendations, and follow-up with online research. Watch this video for some more helpful tips on how to choose a pool builder. A credible business will be willing to provide a work address, phone number, and company website. Ensure that the contractor has the proper certifications, credentials, and licensing, and learn how many years of experience they have. Ask to see samples and pictures of their past projects so you can see the quality or their work and that they’ve done the projects that they claim to have completed. You’ll want to find a pool contractor that’s willing to create the backyard pool design that you want, rather than sell you on what they think would be best. Above ground pools can be affordable, durable, and accommodating to your space. If you’re planning on investing in an above ground swimming pool near Birmingham, AL, you may be wondering what options are available. Above ground pools are extremely customizable and can provide families with a flexible way of adding the fun of a swimming pool to their backyard. Frame pools are a durable above ground swimming pool option that can remain up year-round, but can also be quickly disassembled if necessary. These pools come in a broad range of shapes and sizes, but the most popular varieties are round and 24 feet in diameter. Frame pools are typically four feet high, but can be designed to have a deep end with a 7-foot depth. Frame pools come in both resin and steel varieties. Steel frame pools can take a significant amount of abuse, often bouncing back into shape if they are bent. These pools are coated with zinc to prevent rusting, but this protective layer can break down after many years, leaving it vulnerable to corrosion. If rust appears, you can sand and repaint the seal to repair the finish. This option is typically more expensive then steel frame, but they benefit from being resistant to rust and corrosion. 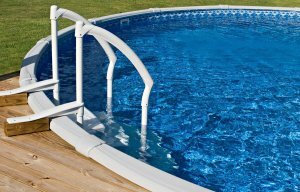 However, when a resin pool is dented, it’s usually permanent, and they are also more vulnerable to cracking than steel frame. Resin frame pools are more modern in appearance than steel frame, but their surface can fade and crack over time. The least expensive option for above ground swimming pools, ring pools are inflatable and are typically 3 feet high and 12 feet in diameter. Also called float-to-fill pool, this option gets its name from the outer ring of the pool that rises as the basin is filled with water, pulling up the walls along with it. Ring pools are an ideal option if you’d like to see if a pool is right for you without committing to the price of a frame pool. When you’re considering installing a swimming pool in Birmingham, AL, don’t forget to look at the versatile options in above-ground pools . These backyard pools make for a great family fun spot or even an effective solution to increasing your exercise. Above-ground pools are the perfect investment for your family and home. If you decide to move, you pack up the pool and take it with you; or you can leave it installed as a way to increase your home’s value. Whatever your reasons for installing an above-ground pool, here are the two best options to choose from. The Doughboy above-ground pool design is an amazing feat of pool technology. It may look like a regular 52” above-ground pool, but, once you get in the water, you’ll find a surprise. Doughboy pools are expandable to have a 7’ deep end. This pool design doubles as an above-ground and in-ground pool for your convenience. You’ll never feel the decline, and you have a choice of how deep you’d like it. Elite AllStar above-ground pools are similar to what you imagine when you think of an above-ground pool. The difference is, the Elite option is an incredibly strong pool designed for your safety and convenience. The galvanized steel frame is coated in a vinyl shield for added protection against corrosion and rust. Elite come in a variety of size options for your fun and exercise. 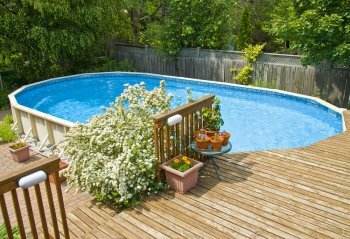 Some people may be hesitant to install an above-ground pool for fear of losing a patio deck option. That’s not the case anymore. Your pool and spa installation company can offer a variety of different patio decking options to complement your above-ground pool. Depending on your backyard size and shape, there might be some wiggling required to find the best spot, but don’t let lack of a patio stop you from saying “Yes” to an above-ground pool.